Hello reader! My name is Allison, and I am a 41 year-old mom of four looking for a creative outlet of sorts to document the remodel of our new home. So welcome to my blog. I am flattered you have decided to take a look! We have owned other homes in the past (4 to be exact, so our home purchases now out-number the kids, which qualifies as two ways we have over-extended ourselves!). We have fixed them all up to varying degrees (homes and kids), but this new one is a doozy. This remodel will be like none we have done before. Back of the house facing the yard. Front the house (at an angle). Now you can see the front door. Interesting property, huh? 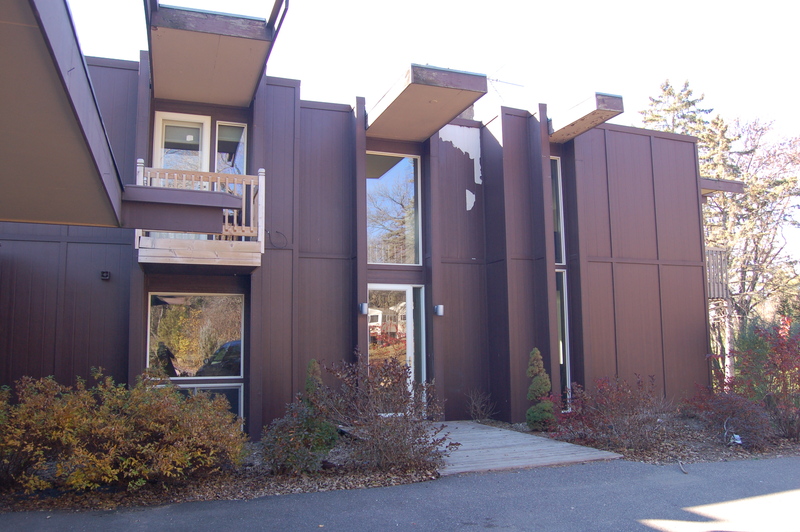 This bad-boy was originally built in 1964, designed by architect James Stageberg. 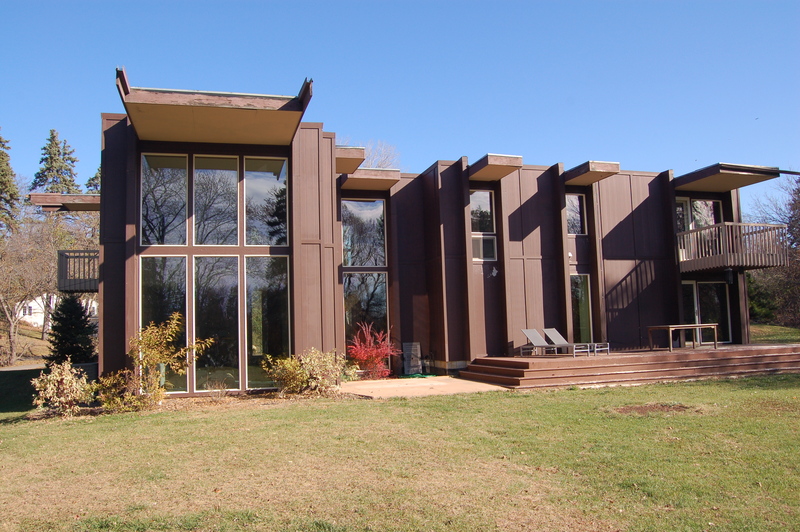 If you are into architecture and live in Minnesota, you may have heard of him. Anyway, I admit that after learning this home was designed by a Harvard-educated architect, the rotted awnings and peeling paint couldn’t dissuade me from seeing the possibilities. Another thing it had going for it, was its price. As you can imagine, its condition turned off many a buyer. 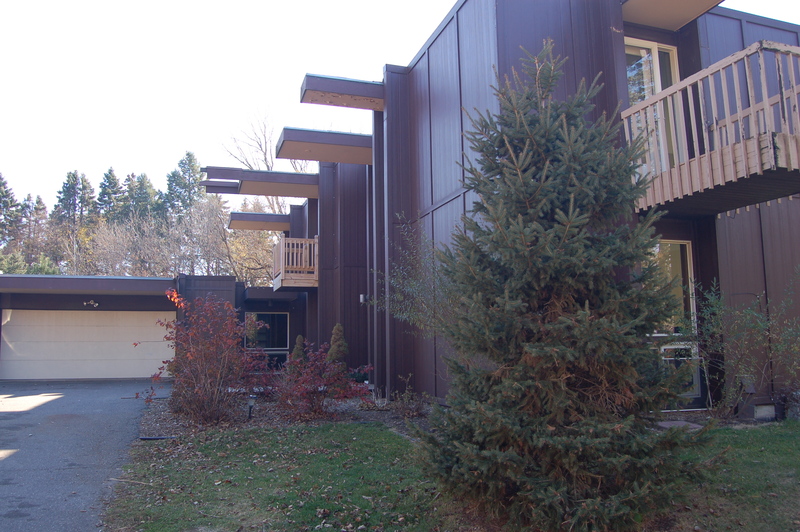 Plus, it is located outside the hipper Minneapolis neighborhoods where modern architecture is better appreciated. This house is just out of Saint Paul (our preferred twin city), where traditional reigns supreme, generally speaking (even though I hate generalizations). There’s no denying it; this house is an odd-ball. My intuition told me that this ugly-duckling could one day be a swan. So we bought it! The day we closed on the house, I started emailing architects, with hopes of getting started. Our plan was (and still is) to stay in the apartment we moved to after closing on our old home, while work was happening in the new house. So, just to clarify, we are not living in the house. The six of us are in a cozy apartment. It’s been 5 months. At least it didn’t take me long to find the right architect. He is actually a friend of an acquaintance. But more important than that connection, he was the only one who didn’t flinch when I explained our budget. THE BUDGET. It may not mean much to you, considering you have yet to hear the extent of the work that needs to be done. You have not seen the inside either. Let’s just say the main floor is a total gut-job. Plus there’s the new carpet needed upstairs, new upstairs laundry, and basement improvements. Oh! and the inspector said a new roof is in order too. How much would you guess needs to be put into this house? As I am somewhat reluctant to share financial information, especially in this friendly format, instead of me just telling you our number, suffice it to say, it’s low. Still a good chunk of change, but remodeling is expensive, and there’s a lot of work to be done. I think of our budget as a challenge to be super creative. And our architect seems to be on board with tapping his creativity in designing to our budget. He’s young, and although admittedly busy, not too busy to take on our project. So after a few preliminary meetings, he came up with some cool floor plans and elevations. Discussion for another post, another day. And you don’t want to miss hearing about our search for the right builder. Stay tuned!